Anandamela on March 20, 2011 (Half Dozen Bhuter Golpo) ebook pdf. 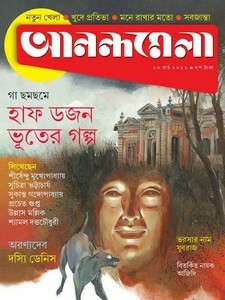 Little friends, now I'll share with you an old edition of Anandamela Bangla magazine. I'll share, cause there are half-dozen horrible ghost stories in the magazine and all these stories are written for you by very famous author like Shirshendu Mukhopadhyay, Suchitra Bhattacharya, Sukanto Gangapadhyay, Prochet Gupta, Ullas Mallick, and Shyamal Dutta Choudhury. View or get the Anandamela on March 20, 2011 ebook pdf.